Chronobiologists are not in favour of shifting the social clock backwards and forwards twice a year, because of negative effects on sleep and other possible harmful health effects. In the news section of this website the subject has often been discussed. 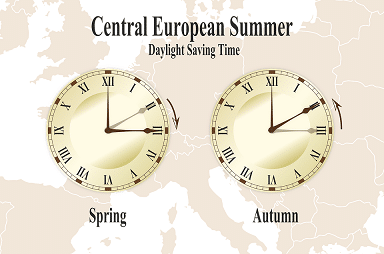 In recent years, the number of advocates for abolishing summertime completely has grown, and the topic also appeared on the European political agenda. And now it seems like it really might be going to happen. A group of members of the European Parliament will bring a resolution to the vote on the end of the daylight saving time. If that resolution is taken, this would be the first step in the process of possible repeal of the forwards and backwards shifting of the clock in the fall and spring. Update October 28, 2017: Tonight, October 28, we still have to shift our watch. The hour between 2 and 3 a.m. we experience twice. In other words, we can sleep for an hour longer toniight, if we want to. When we get up, the biological clock has prepared us well. The shift to winter time generally causes less problems. The media again paid much attention to the summer and winter time phenomenon, especially with a view to the possible abolition. Chrono @ Work has participated in interviews for Scientias, SBS6 Hart van Nederland, TV Drenthe, and the NOS news.